My DVR recorded the hard to find 1961 film A Majority of One tonight on TCM, and I’m glad I won’t have to watch it — I was able to get a Warner Archive DVD copy via interlibrary loan earlier in the week and view it that way instead. This was my first experience with an “on demand” disc, and I found myself in agreement with the vast majority of people who champion the service. The transfer was crystal clear and the disc was pleasantly void of the innumerable obstacle screens that ruin most commercial DVDs. If free interlibrary loan wasn’t a perk of my teaching position I wouldn’t hesitate to purchase discs from this line. There are two sticking points regarding A Majority of One that will dominate most discussions of the film and need to be gotten out of the way before any worthwhile assessment of the picture can happen. First is the casting of a Caucasian in the male lead. 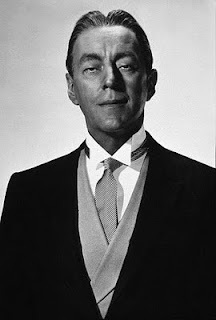 That master of disguises, Alec Guinness, plays Mr. Asano, a Japanese business magnate whose business dealings have attracted the attention of the US government. Realize going in that on a superficial level this is a romantic comedy about a widow and a widower from different cultures finding love in their golden years, but more importantly it’s about the healing of Japanese and American cultures in the wake of the war, interracial marriage and subsequent bigotry, with a little generational friction thrown in for good measure. My take on the casting of Guinness is this: Hollywood has always been in the money-making business, and I’m choosing to applaud them for broaching the subject in an A-list feature film, even if the producers elected not to cast an Asian performer in the male lead. If the film doesn’t get made without Guinness in the featured role, then I’m happy to accept it under those circumstances rather than not at all, knowing that Hollywood would eventually come around, one baby step at a time — though there’s really no reason why a Japanese actor couldn’t have been cast, other than the argument that Guinness’s star power would sell more tickets. One could argue that since the earlier Broadway production of the play (a big hit at 556 performances and multiple Tony nominations) starred Cedric Hardwicke in the role of Asano the precedent was already in place, but on the other hand James Shigeta and a primarily Asian cast was starring in Flower Drum Song at the same time over at Universal. And while I wince at Guinness’s performance a little (his idea of playing Japanese translates to a tilted back head and squinty eyes. He never once looks right. ), the attempt at Japanese never strays into caricature — a flaw that greatly mars 1961’s most well-remembered film: Breakfast at Tiffany’s. The second sticking point is A Majority of One’s rather gaudy running time of two-and-a-half hours. Considering the film is essentially comedic, with a sprinkling of dramatic moments that anticipate the flavor of many films from the 1980s, it’s difficult to stay engaged and light in heart for 150 minutes of movie. Although this is understandable when we realize the director / producer was Mervyn LeRoy, who could make a long picture as well as a short one, the exhibition cut of A Majority of One could have easily gone back to the cutting room and lost fifteen minutes of unnecessary footage. Nevertheless, there’s enough good stuff here that anyone considering the viewing film should plow ahead without reservation. 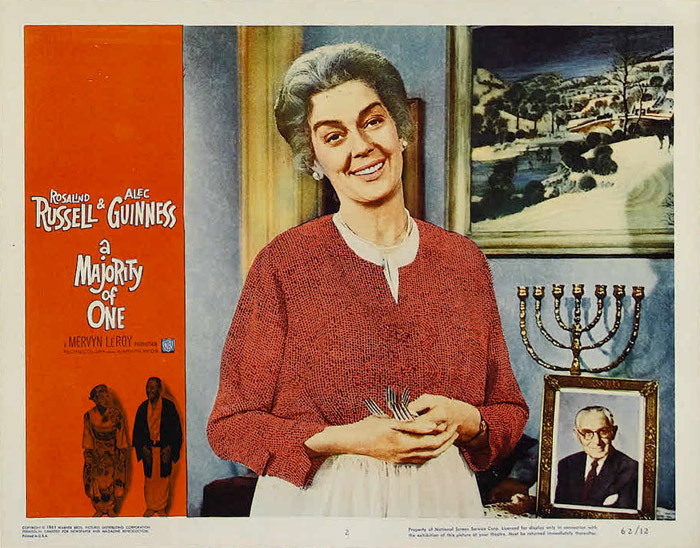 At the top of the heap of all that good stuff is the extraordinary Rosalind Russell, who stars as Mrs. Jacoby, the Jewish mother from Brooklyn who comes to adore her new Japanese friend, despite having lost her only son in the Pacific war. Russell, one of the most extraordinary — and despite the great deal of acclaim she enjoyed, underrated — actresses of her era, simply shines here. She’s the glue that holds this long picture together. Her chemistry and interactions with her each and every one of her fellow performers is different in character yet perfect in tone. Her performance is nuanced by confidence, timing, and restraint — and her accent would make Meryl Streep proud. Despite the fact that Russell, even at 54, was busy juggling film, TV, and theatrical projects, it’s clear that she gave herself away to this one. It’s as good a performance as you’ll find in any film from the period, yet one that despite its brilliance was snubbed by Oscar — A Majority of One’s sole nomination came in the Color Cinematography category. Regardless of Oscar’s mild drubbing of Russell (four nominations, zero wins. Hersholt Humanitarian Award in 1973, three years before her death. ), the Globes simply adored her. She would win Best Actress Musical/Comedy for this film, and then again the next year for her work in LeRoy’s next project, Gypsy. 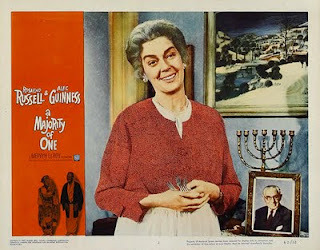 She had previously won in the Musical/Comedy category in 1958 for her signature performance in Auntie Mame, and in the Best Motion Picture Actress category (the Academy equivalent) in 1947 and 1948 for Sister Kenny and Mourning Becomes Electra, respectively. If you can catch Roz as a nurse in Kenny on TCM do so, but I’m on the record with Electra as one of the strangest classic period films out there — it isn’t for everyone and it isn’t the Roz most people know and love. There are many victims of Oscar snubbings, but with five Golden Globes and no Oscars, Russell has to be at the top of the list. Performances aside, the film’s themes of forgiveness in the wake of the war and of interracial love may date it with younger viewers, but the script is rich enough to remain interesting and the dialog certainly entertains. Granted the film is overlong, there’s enough here to warrant a viewing. My one qualm: Mrs. Jacoby warms to Mr. Asano far too quickly — through just a single scene early in the picture — and LeRoy misses the opportunity for dramatic fireworks between his two stars, especially when both were as adept with drama as they were with comedy. 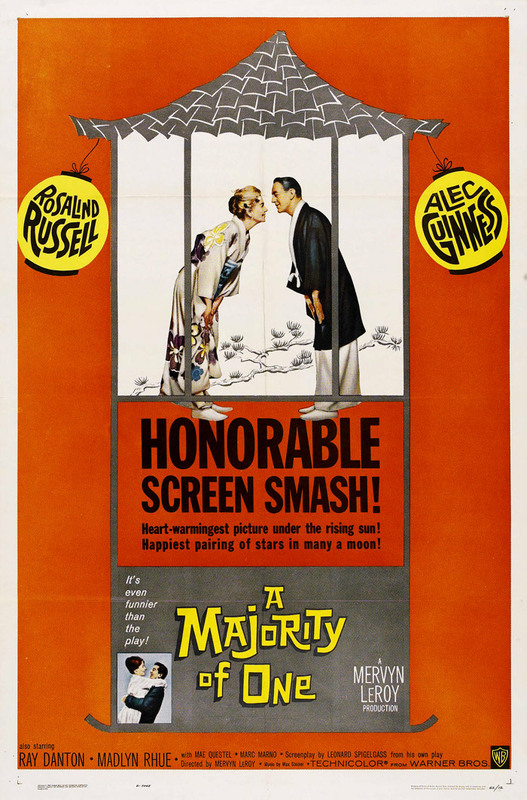 The scene in which the pair meet on the deck of an ocean liner deftly blends dramatic tension with physical comedy — the movie sells out for affability when a great deal more character development was possible. Availability: Warner Brothers Archive DVD, TCM. Odd as it may seem, the objection and criticism that was abound because of the ethnic diversion, religious difference, and the early mumblings of political correctness, everyone has overlooked the fact that this was a comedy. There are no rules for comedy. 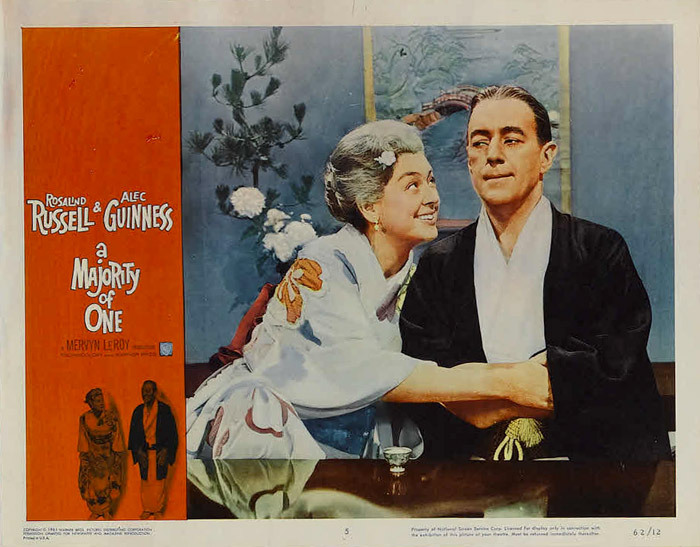 For example, if the lead role was done by Peter Sellers, who by my opinion would have been better suited for the role than Alec Guinness, no one would have mumbled anything simply because that was the nature of Peter Sellers comedy. Yet, Sellers was not yet a big screen draw in North America, at least not on a wide spread spectrum because his most popular release in North America to date as of 1961 was The Mouse That Roared where he establishes himself as an actor who could handle multiple roles in a film. Then Sellers hit it big with the 1963 release of The Pink Panther and followed up with the cult favorite Dr. Strangelove where he again did multiple roles. As I have watched A Majority of One through the decades, all I can think of is, Alec Guinness for all of his talent is really so wrong in this movie. It even came to my attention through the genius of Peter Sellers that Mr. Sellers himself was spoofing his countryman Mr. Guinness when he put on his mock Asian disguise in his role as Inspector Clouseau. Such as the British are wont to do, have sport at everything and everyone for the sake of a giggle and a laugh. Still it was Rosalind Russell who stole the show, in spite of her being a devout Catholic playing a Jewish woman, after all, it is acting, there is no stature in the art of theater that states the actor must be what they are in real life. What about historical eras where women were not allowed to act and men had to play both roles. Some cultures it was the opposite, men were not involved in any form of entertainment, they were either royalty, scholars, men of medicine, or warriors. Political correctness has no place in fictional entertainment. It's fine for documentaries, and edgy at best for biopics. Yet, this was one of the films that started the noise, and the Academy of Motion Arts and Sciences fell right in line by snubbing this movie.